Get some great deals on these fantastic sauces now! Just in time for Superbowl Sunday! We thought it would be a great service to the chilehead community to help our small business friends out a little and at the same time get some good sales to encourage some extra purchases for the big game of the year. The companies below are offering some very nice specials to you to help hoist your football gatherings to a new level of Super. Check them out, and give them some love back. They can always use some extra business during the cold Winter months. Thanks to everyone that participated! All Discounts/Sales below are US only because of shipping costs. The Peppermaster brand is from Canada though, so their rates will differ. HoneyBlaze – Wing Sauce in Original, Medium or Hot – Twin pack $10+ shipping. Gunther’s Gourmet – Any product $4.99 each. If you purchase $24.00 or more – enter “Gunther10” in the coupon code box and get an extra 10% off. Rippin’ Red – Two bottles of Rippin Red for $10.00 and free shipping!. Order must be in the US for Free shipping! Starting this Friday Jan 20th up until the Friday before Superbowl! Crazy Good Sauce – Crazy Good 4 pack will go from $28.00 to $22.00 with free shipping. US only. Cajun Heat – Cajun10, buy any two products and receive 10% off… Cajun15, buy 3 or more products and receive 15% off… Cajun20, buy 6 or more products and receive 20% off… I’m moving anyway from “set” gift baskets and allowing the customers to “create” their own and save in the process. Xerarch’s Salsa – Everything is 10 % off from their website. Coal Gulch Trading Company – order any 3 of our products through our web site, we can bill cc through Paypal and mention your part of this group and I ship for free( as long as you get your order in time for normal shipping rates). Our salt free rubs make excellent dips and cover all the heat ranges, and our hot glazes will make your wings fly…..we are working on our cart so emails will have to suffice for now, but its still easy to do. Ashylynn’s Gourmet – BOGO OFFER FROM ASHLYNN’S GOURMET!! January 23 – 27 buy any 1 SOLOMON’S PUNISHMENT off our website and get 1 FREE!! JACS Tailgaters – starting Monday 15% off everything. We will also be posting some great Tailgating Recipes on our site. Defcon Sauces – Right now, until the Monday after the Superbowl, all quarts of wing sauce are 20% off. Keep in mind, we leave for Zest Fest in Texas this coming Wednesday at 3:30am, and won’t be back until the following Tuesday, January 31st. During this time, we will be unable to ship orders. Order by this Tuesday at noon, or I won’t be able to guarantee delivery by the Superbowl. Half-Breed Salsa – We will do 3 (pint) jars of Half-Breed Salsa for $15.00 no shipping (unless requesting special type shipping). We have two heats available: Half-Breed Medee-oh and Half-Breed Nosebleed (medium & hot, respectively). The Madison Chocolatiers West – 10% off all spicy chocolates and confections. 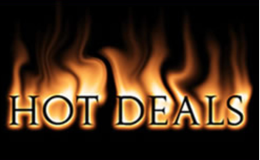 Volcanic Peppers – Free Volcano Dust 2 with any order over $10 – Enter Superbowl in the note to seller box upon checkout. Jack’s Meats – Free shipping on any order placed until Superbowl…….as you know shipping on hot sauce can be expensive……..Includes my new limited edition Devil’s Blend,the Devil Pig Bottle reserve limited to 10 bottles and the Devil Bottle limited to 25 bottles…..each of the last two can be seen on Hell Fire Hot Sauce on face book and are hand sculpted by one of this country’s top potters!!! Jeff’s Chile Spot – @chilespot is offering our new 9oz bottle of our Fatalii Fantasii Sauce whenever you order our 5oz bottle – thats over 44% more FREE for any ordered by Feb 4. This is a Bajan style mustard based sauce with Fatalii and Jamaican Scotch Bonnet pepper with mango, lemon, and island spices of nutmeg, coriander, ginger and allspice. We also have a great Heirloom Tomato Fatalii Pepper Salsa. (continental US only, substitution will not show up in shopping cart but will be made at pack/ship time) order. Fat Cat Gourmet Foods – 20% off their complete purchase (before shipping) by entering the coupon code “SUPERBOWL” during the checkout process. Intensity Academy – Buy any 5 products for only $20! Use coupon code: “Any5bottles_online” at checkout. Highly suggest Chai Thai, Garlic Goodness, Hot Cubed, Gypsy Gold Dust & Chipotle Chup to enhance your Superbowl Menu. I’d like to take advantage of some of these great deals but I’m a bit overwhelmed & don’t know where to start! Can you make some recommendations based on the things you’ve tried? I’m primarily interested in wing sauces/rubs. Thank you! Of the wing sauces I’ve had, you can’t go wrong with any Rippin Reds or Defcon sauces. If your are only interested in wing sauces… Well there ya go. It’s easy.